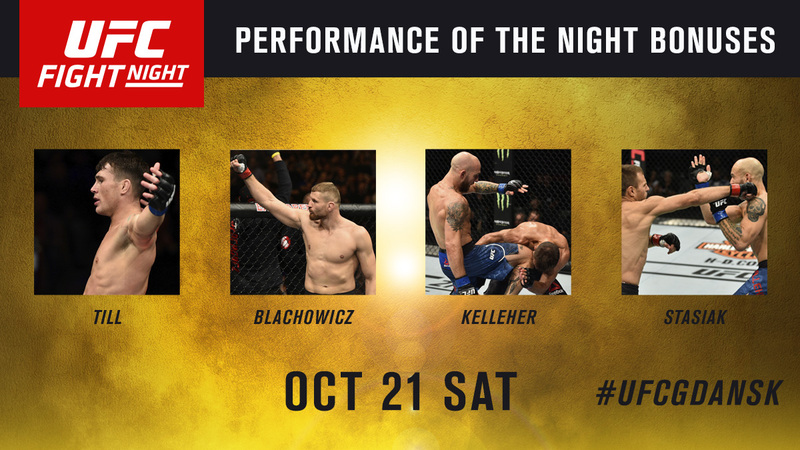 Darren Till, Jan Blachowicz, Brian Kelleher and Damian Stasiak took home the performance bonuses from Fight Night Gdansk. Each fighter will receive a check for $50k for their efforts. • Blachowicz pulled off one of the most amazing rear naked choke submissions in UFC history. The light heavyweight grabbed ahold of Devin Clark while the two were standing and was able to force a tap without either hook in. Blachowicz snaps a two-fight losing streak. • Brian Kelleher and Damian Stasiak battled for almost 15 minutes before Kelleher was able to finish Stasiak by TKO late in the fight. For their efforts, the two received Fight of the Night honors.